5 Cuttings. This Wandering Jew gets small, delicate pink flowers during most of the summer that really stand out on the purple foilage. In warmer zones, it can be used as a ground cover under your taller specimen plants. They grow best in shade or partial sun. They also make EXCELLENT house plants, especially in hanging baskets, growing very well in containers at home or the office. You are buying 5 unrooted cuttings of 'Purple Heart' Wandering Jew. Each cutting will be between 6 - 10 long and ready to root and grow in your garden or container. This will be enough to easily fill a one gallon container or 10 hanging basket. These are VERY EASY to root - just don't overwater - they are better on the dry side than too wet. 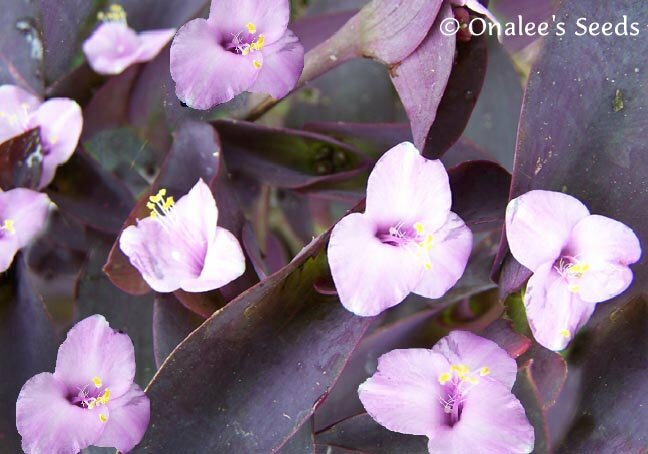 This plant is also known as 'Purple Queen' Wandering Jew, Inch Plant or Tradescantia pallida. This Wandering Jew gets small, delicate pink flowers during most of the summer that really stand out on the purple foilage. It is a perennial to USDA Zone 9 (for certain, because that is where I live) where it can be used as a ground cover under your taller specimen plants. They grow best in shade or partial sun. They also make EXCELLENT house plants, especially in hanging baskets, growing very well in containers at home or the office. These plants thrive in high humidity and will reach 18-24 long/tall. They can grow in partial sun or full shade locations and would be great as a houseplant. They can survive dry conditions - they are quite tough and easy to grow and multiply quickly sending runners across the ground which will root or, if in a hanging baskets, you can clip some and root it yourself for even more plants. EACH ADDITIONAL ORER OF 5 CUTTINGS PURCHASED IS ONLY $7.50 ! Use the drop-down box near the order button at the top of the page to select the larger quantity and get the discount.